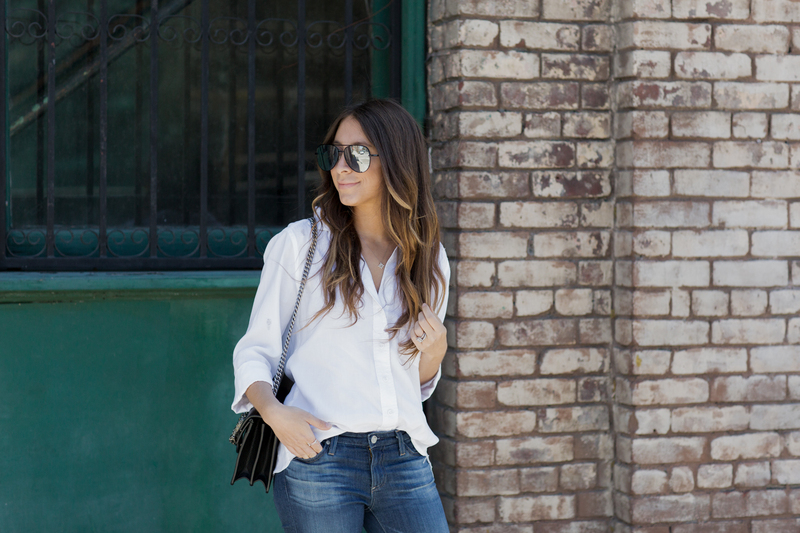 One of my favorite looks is a white button down and blue jeans. It's classic, elegant and you can't go wrong. If you are going for a "safe" look like this, the top you choose and the accessories you pair it with are key. This blouse is from Bella Dahl.As you guys know, I am a huge fan of their tops. They fit so well and the material is amazing. I got this one when I was in Miami over Christmas. It has rips on it, which adds a different twist to the typical white blouse. I've mentioned it before but I almost always get the tail of button down tops shortened. I brought this one in and the tailor was like "OMG, there are so many holes!" I was like yes, it was designed that way (LOL!). I paired this look with my beautiful Anzie jewelry and white Manolo Blahniks. When I got these shoes a few months ago I asked the sales woman if I could try them on in white. She was like "of course, when are you getting married?!" To which I replied, "almost three years ago." I know they're very bridal but I've always been in love with them and don't own any other white pumps. So happy to have these as part of my collection.